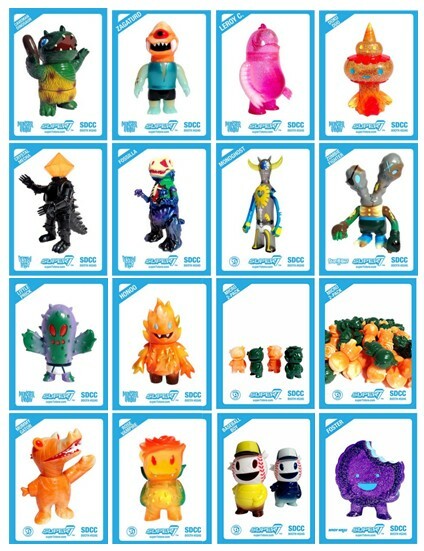 You’ve seen all the teases, but now you can see the complete line-up of Vinyl Toys that Super7 has made Exclusively for San Diego Comic Con 2013! 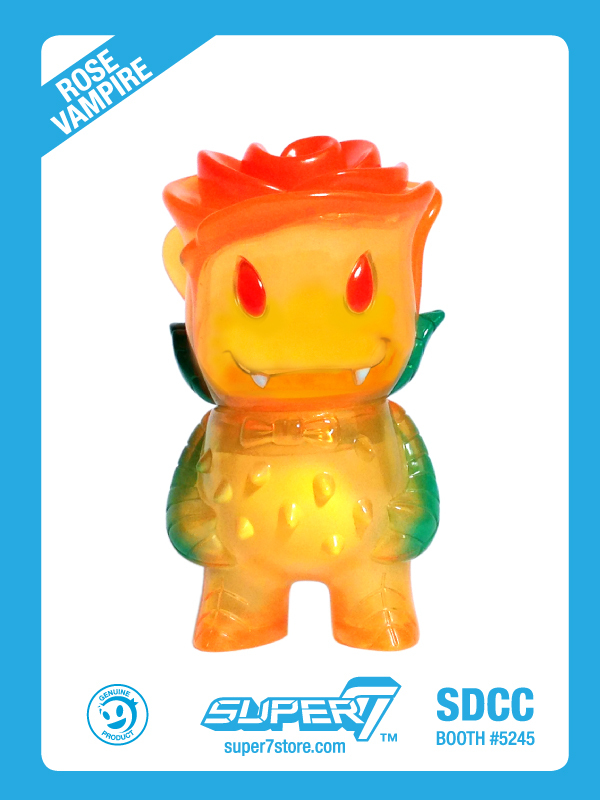 Please visit booth #5245 to get your hands on these Limited Edition collectibles, as they will NOT be available on super7store.com before or after the event! Read on for images and details on all fifteen exclusives! From the haunted bakery to your shelf – the Kandy Kaiju are monstrously cute confections. 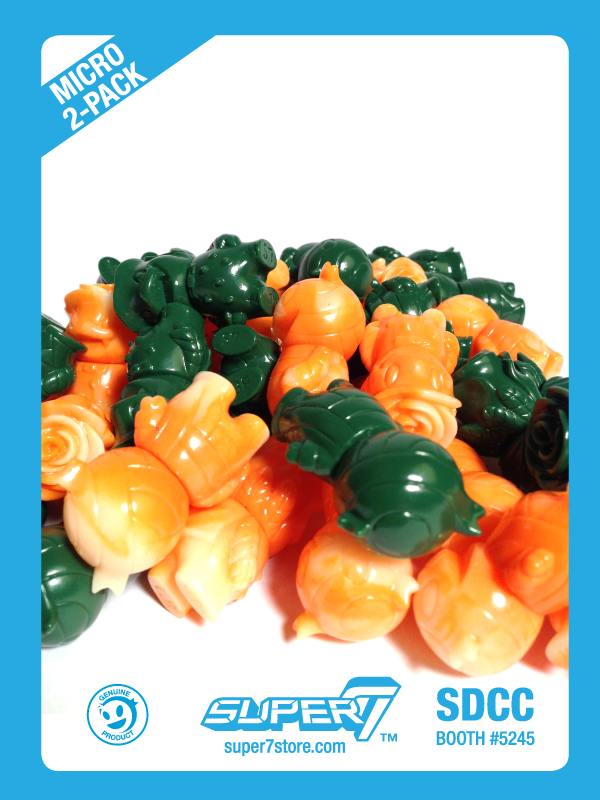 But be careful….you won’t be able to eat collect just one of these 3” sized Japanese vinyl figures! 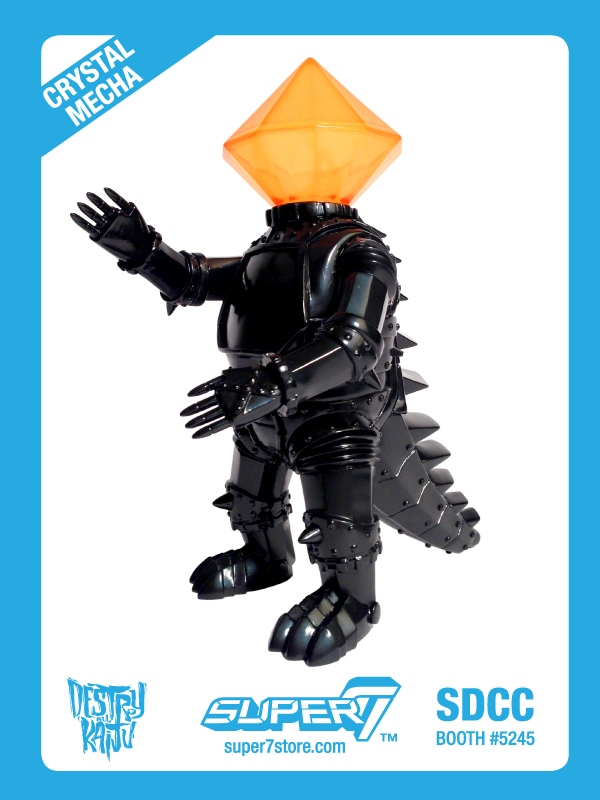 These new Kandy Kaiju characters now come in illustrated header card packaging. 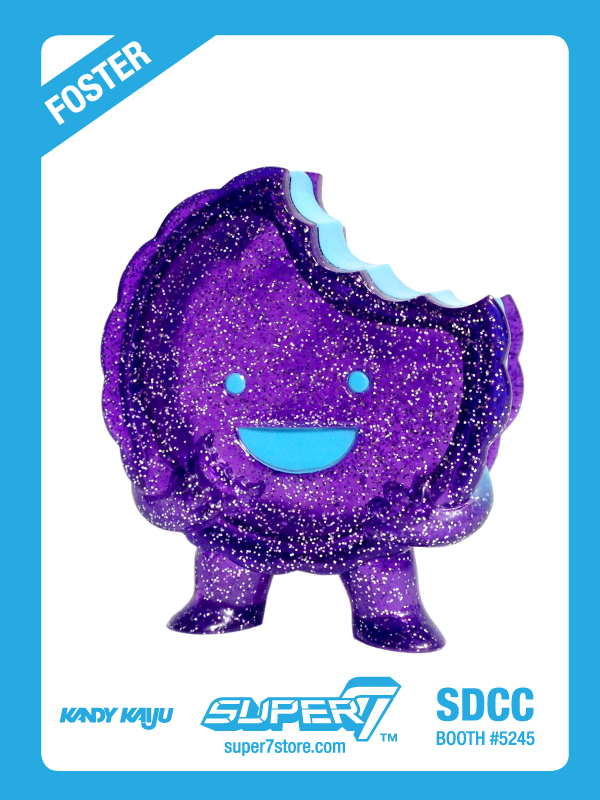 Everyone’s favorite cannibal cookie is back in a delicious new flavor: translucent purple vinyl with glitter throughout along with light blue sprays for the facial features and filling. FOSTER is designed by Brian Flynn. A Super7 x Secret Base collaboration! 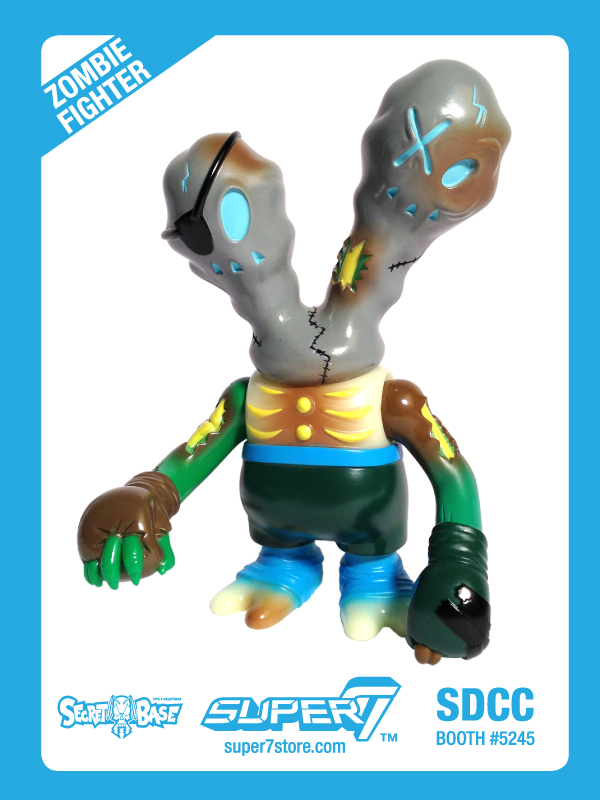 The legendary ZOMBIEFIGHTER is stitched up and in the ring for another battle – this time as a colorful composite of various body parts! The figure is cast in various different colors of vinyl: grisley Glow-in-the-Dark torso, ghostly grey head, and gangrene green arms. Detailed throughout with blue, yellow, brown, black, and dark green sprays. The ZOMBIEFIGHTER measures almost 6 inches tall and features articulated arms and neck. Brian Flynn’s cute and bizarre totem DOKU DUO stares (twice) into the huge crowds of San Diego Comic Con! 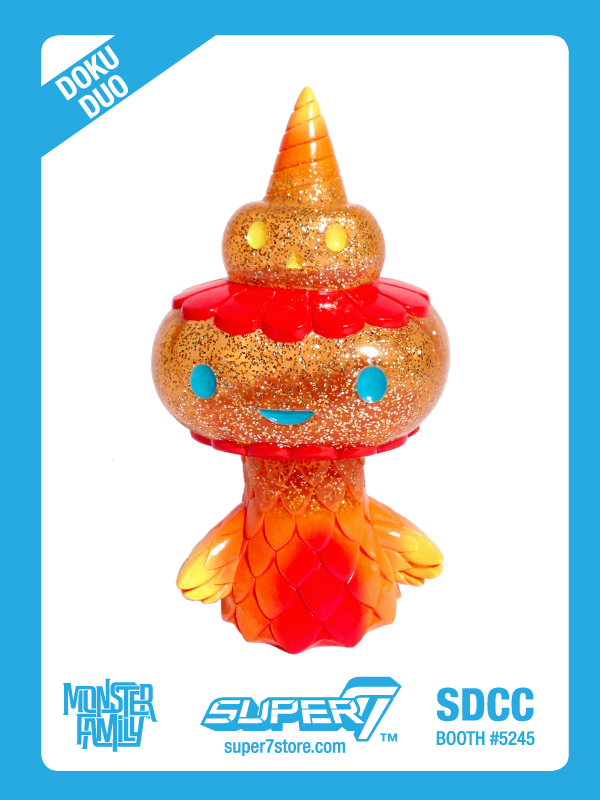 This unique entry into the Monster Family is constructed of translucent glitter-filled orange vinyl with dark orange gradations, yellow, and light blue sprays. This Japanese soft vinyl collectible stands approximately 4 inches tall and can be rotated at the neck. Come to Comic Con to complete your collection of the cute cactus creature covered in colorful cones and quills! Brian Flynn’s Little Prick is just about four inches and ready for Late Night action. Cast in purple vinyl with green and red sprays, along with black trimmed tighty whities. Be it ancient asteroids, impossible aging, or aerobic decomposition, you can’t keep a good kaiju down! Clear the streets (and you toy shelf) as FOSSILLA RAIDS AGAIN! 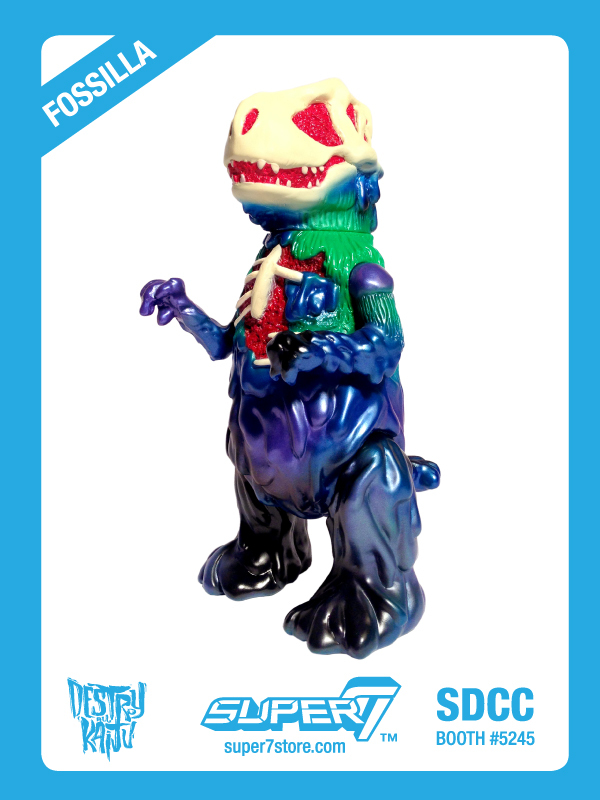 Joshua Herbolsheimer’s part-dino, part-skeleton, part-sludge, all-kaiju creation is cast in goopy green vinyl and decorated black, violet, and metallic purple sprays along with blood red guts and bleached bones. 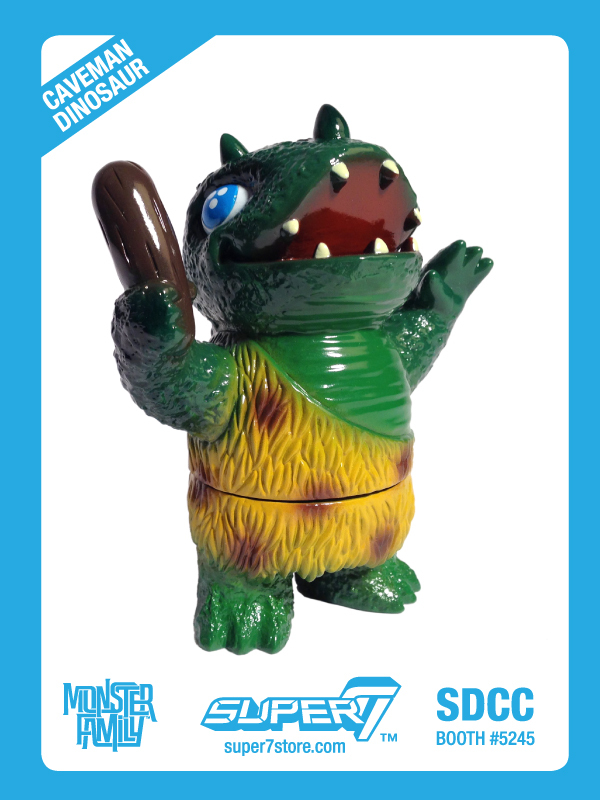 This popular prehistoric personality is a member of the DESTROY ALL KAIJU! line of standard-sized (approximately 9” tall) vintage-inspired vinyl figures, and is able to be posed at the neck, shoulders, and thunderous thighs. 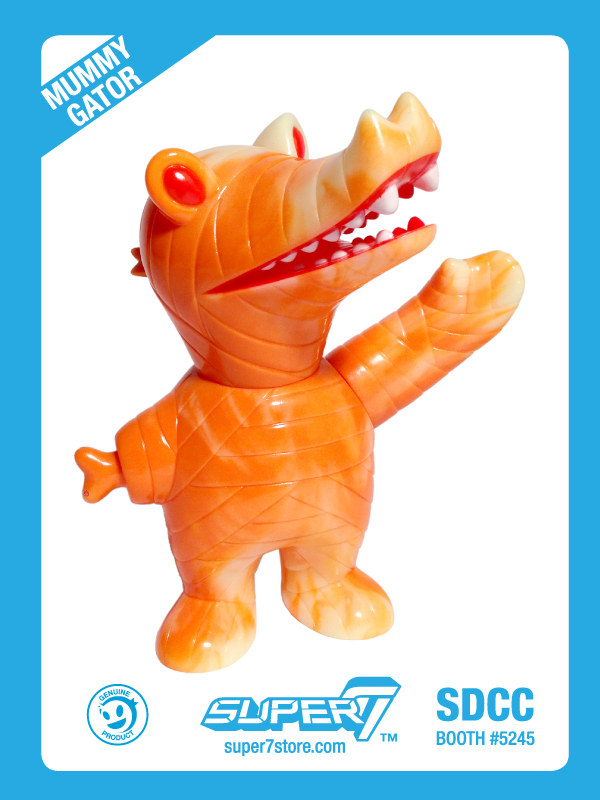 A collaborative project between Super7 and our favorite artist friends, the MONSTER FAMILY is a collection of diverse creatures, from the cute to the creepy. Each figure stands approximately 4 inches tall and is made from high-quality Japanese vinyl. It wouldn’t be San Diego without a tribute to the Padres! 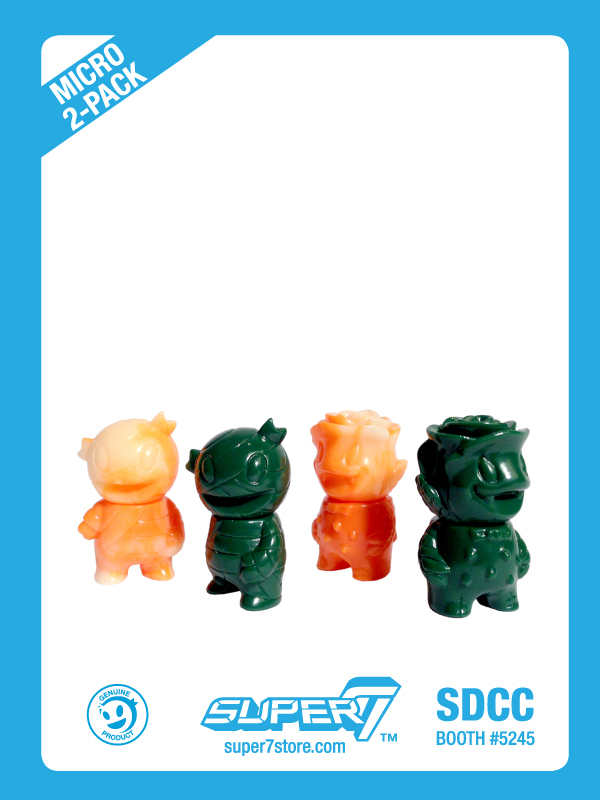 Super7’s mascot is ready to play ball as a Pocket-Sized figure created exclusively for Comic Con – available in both CLASSIC and MODERN color schemes! 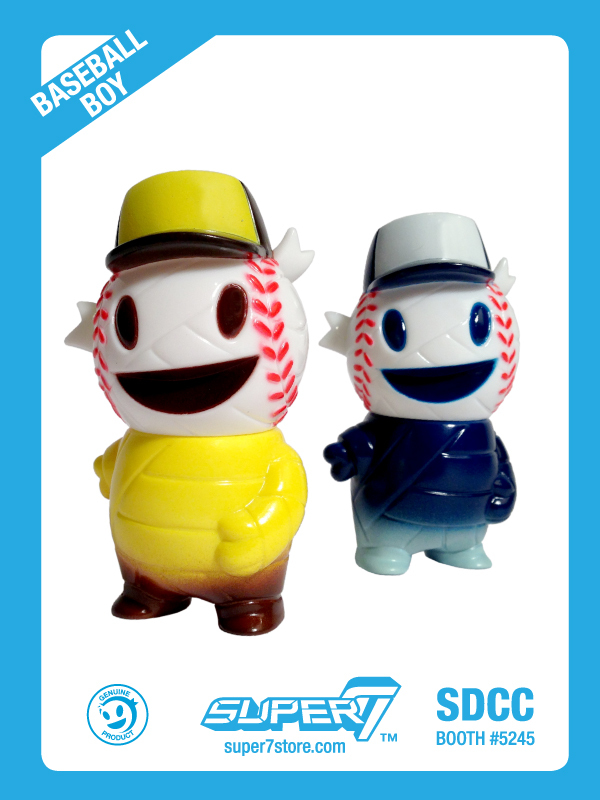 SD Classic BASEBALL BOY shows of the iconic color scheme of the team, featuring a yellow vinyl torso and white vinyl head. Brown, black, and red paint details complete the Classic team look.